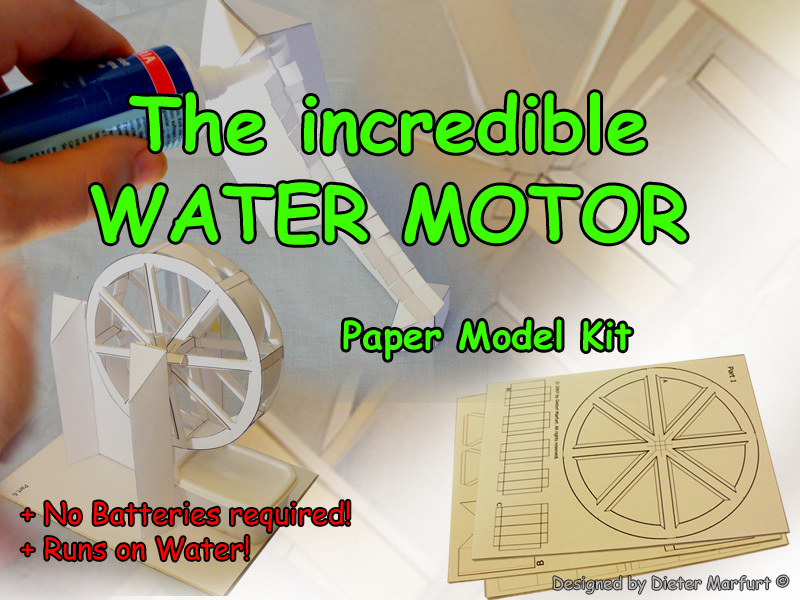 This is a Paper Model Kit for a proof-of-Concept Water Motor, a working Osmosis Motor. It operates for Weeks with a single Liter of Water. A Computer and a Printer and some common Household Materials are required to build it. The Paper Model Kit Files, ready to be printed on an ordinary Printer. Interactive Assembly Guide with Step-by-Step Instructions and more than 60 zoomable Pictures. Operation Principle explained, long Time Test Insights. Additional Tipps and Construction Help. In Order to build this Motor some additional common and cheap Household Materials are required (E.g. Pins, Paperclips etc.). Great for School Science Projects, Classrooms and Hobby Scientists! -The Motor may not work under extreme Temperature or Humidity Conditions. -The Motor is fragile and weak. -Use inside, do not expose to Weather. -The Motor may run slowly and pause for Seconds frequently. -Some Parts must be readjusted from Time to Time. continous Operation (The Design allows to replace them easily). -This is not a Perpetuum Mobile since it turns Heat into mechanical Energy and runs by Cooling the Enviroment. requires some basic Skills in assembling Paper Models etc. -The Assembly of the Motor may take a few Hours of your Time. © Copyright by Dieter Marfurt for overunity.com , all Rights reserved.